It appears that Amir Khan hasn’t given up on steady pursuit of a career payday fight against Floyd Mayweather Jr despite the signs not looking good that he’ll be getting a fight against the superstar in 2015, if ever. 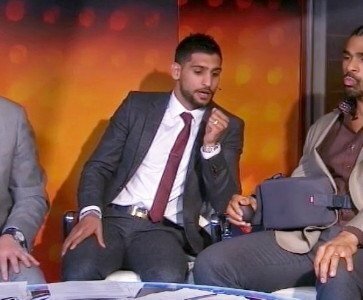 Khan is now saying that he’s hearing from boxing experts that Mayweather is afraid of him. Whether this is true or not impossible to tell, because it’s nothing more than speculation and guesswork from the so-called experts. What we do know is Mayweather feels that Khan doesn’t bring enough to a fight in terms of his popularity in the U.S, and for that reason he’s dismissing him as a potential opponent for him. If Khan would take some chances with his career to raise his profile in the sport by taking on guys like Keith Thurman and Kell Brook, he might be able to get a fight against Mayweather. It might be too late though. Even if Khan were to get those two fights back to back in 2015, he likely won’t be able to catch Mayweather before he steps away from the sport after finishing his remaining 2 fights with Showtime. Mayweather has said that he plans on stepping away from the sport after his contract expires with Showtime unless they want to give him a new one. He could come back in 2016 if given a new contract, but it’s not likely that he’d be coming back to fight Khan unless he increases his popularity by taking on some live bodies like Thurman and Brook. A fight between Khan and Pacquiao is also a long shot, but not for the reasons some boxing fans think. Khan being with adviser Al Haymon would seem like the logical reason for why Khan will never get a fight against Pacquiao due to Haymon and Top Rank not working together with fights. But, another reason that may be even more important than this is the way that Khan fights. Since joining up with trainer Virgil Hunter, Khan’s fighting style has become more like Andre Ward’s with him doing a lot of holding on the inside to keep his opponents from getting their shots off the way Ward does. Khan’s holding style of fighting could keep him from getting fights against Mayweather and Pacquiao for good unless he changes his style back to the way it was before he joined up with Hunter.